Originally posted on Topdown Charts. 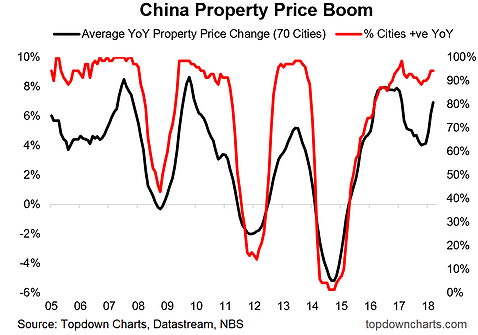 At the risk of being labelled a reductionist or accused of oversimplifying, my view is this: With China, the key variable is property prices. 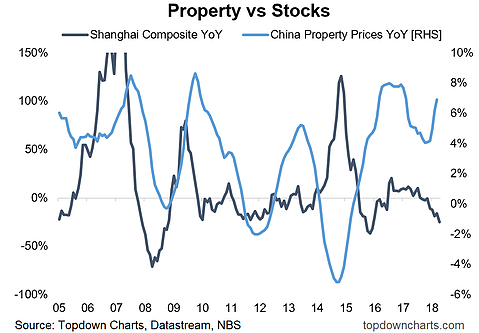 In fact, if I only had one indicator to look at for China it would be the movement in property prices, simply because they both reflect changes in macroeconomic policy and profoundly influence the short-term economic cycle there. Don't miss: Is the U.S. Housing Market Heading for a Crash? Before we look at the two key rotations, it's important to take stock of where things are right now. After slowing slightly around the turn of the year, property price growth has re-accelerated in the past two months and the breadth of gains have broadened out slightly. 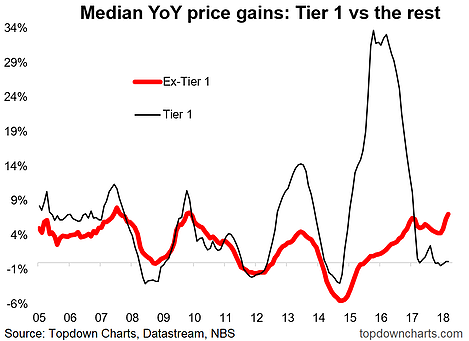 A key reason for this re-acceleration is the surge in prices in ex-tier-one cities. These markets were initially left behind by the frantic pace of gains in the largest cities (which by the way are now seeing slight declines i.e. Beijing/Shanghai). The broadening out of the property price boom or rotation to the smaller cities creates cyclical upside risk for metals demand and economic growth outside the major cities. The other key rotation, and I think one driver of gains is the downturn in the Shanghai Composite (or China A-Shares in general). With Chinese investors very limited in their investment menu (most are confined to domestic stocks, domestic property, and domestic fixed income - given the restrictions on capital flow and limited availability of offshore investment options)... you tend to see this sort of rotation effect. The marginal speculative investment dollar in China is very active, and I believe what we are seeing here is basically a rotation out of stocks and into property. So there're a couple of takeaways, first is the highlighting of these key trends/dynamics. But perhaps more importantly are the prospects of upside overshoot in property prices, and hence prospective tailwinds for emerging markets and commodities. As for China A-shares, it would by logic mean an ongoing headwind in the short term, but it also highlights a potential catalyst for upside there i.e. should property price growth rollover. I would recommend you do as I do and keep a close eye on Chinese property prices.